Every enterprise, be it a small one or a big one, the common objective or the common business goal is to run a profitable business solution. Every business action revolves around a single mission of maximizing the profit or increasing the revenue via limiting the total business expenses. The ultimate goal is to draw the maximum return from the least investments made. ERP software can make this dream come true. An ERP software plays a pivotal role in streamlining the business operations, especially while a company is in the expansion phase. Here, the ERP software tool comes with numerous management functions that cater to every business segments such as Human Resource, Marketing, Sales, Accounting, Purchase, Warehouse or Customer Relations. An ERP helps the businesses to forecast their sales, reduce their operational costs, eliminate the wastage of resources, managing their workforce, maintain a healthy relationship with business clients, in short maximizing the business profit via looking after every internal and external business activities. A right ERP implementation thus helps the business organizations to achieve everything that they sought or dreamt for. But many companies, they hold themselves back from implementing the ERP solution for managing their business. The reasons cited are many. 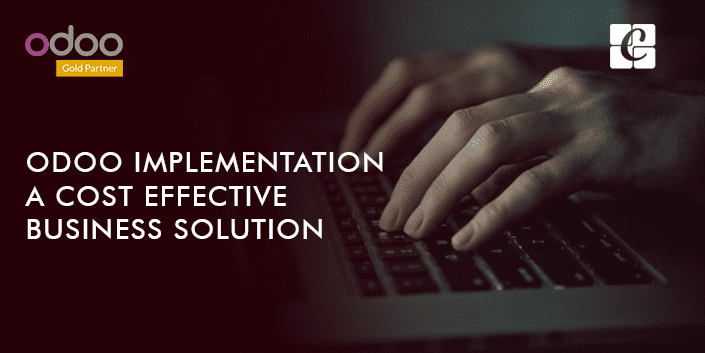 Many companies refrain themselves from the ERP implementation, primarily fearing upon the implementation costs involved in them. But this is true when we take the case of proprietary ERP solutions such as SAP, Microsoft Dynamics, Oracle, and other software. These proprietary software applications charge a huge sum for their implementation process from clients. But now, this fear and confusion over the ERP implementation can be subdued with the introduction of Open Source technology. Today Odoo/Open ERP offers a highly cost-effective implementation solution for businesses, making no big burden to business companies. Odoo, being an open source, the ERP implementation comes as the cost-effective or pocket-friendly process for business, no matter how big or small, or what industry the business belongs to. Odoo, open source ERP application comes with integrated modules that are capable of handling every major and minor business departments, making it an all-inclusive, comprehensive suite of business application software. Odoo, right from inception has created a strong niche in the market, branding themselves as the most popular ERP application in the open source category. Being an open source application, it comes as a highly cost-effective implementation solution costing only 1/4th of proprietary odoo ERP implementation charge. Below enlists the benefits of Odoo implementation for your business. It is seen that many companies, especially the smaller enterprises, they use multiple applications for managing their multiple departments such as Human Resource, Customer Relations, Accounting or Warehouse. When a company or business runs different applications, that itself costs a huge sum for the enterprise, as every application demands further customizations and maintenances in future for keeping themselves up to date. In short, multiple applications demands multiple vendors and software management procedures. Therefore, it is advocated that the company go for a single software that encompasses every business function. Odoo ERP, as said above comes as an integrated suite of application with inbuilt modules featuring Human Resource, Sales and Purchase, Inventory or Warehouse Management, Accounting, Customer Relations and more. From Odoo implementation, the business avails single software application for managing their multiple business departments. Keeping in mind, the limited IT budget many enterprises such as small and medium one’s refrain themselves from ERP implementation for business management. But today, this scenario can be changed with the use of Open Source ERP application, which comes with relatively low-cost ownership. Open Source ERP or Odoo is made available at very low cost for managing every major business requirements corresponding to the business organizations. Odoo’s cost-effective feature comes as an imperative benefit to any business group or small-medium enterprises. The finest technology and ultimate functionality of Odoo never disappoint its end users. The incurred feeling of high implementation cost in Odoo is soon ruled out with its unlimited functionalities and feature standards. Though the initial implementation costs seem higher, this gut feeling is erased soon as Odoo end users are served with a wide array of tangible & intangible benefits, making it a cost-effective and pocket-friendly choice among the business circle. Odoo implementation comes to cost-effective as they lower down the costs involved with respect to administration operational functions, inventor costs, maintenance costs or more. These intangible benefits come as an additional benefit to business, as they considerably reduce the business expenses. As Open Source application is freely available on the internet, it is easy for the end user to initiate a market research or conduct a practical study on the application, checking the possibility and suitability of Odoo application to one’s business workflow. The end user can propagate or trigger for a requirement check on the features and functions of Odoo before going for their implementation. One might think or doubt about the potentialities of Odoo, as it is freely available on the internet. But as soon as you start unearthing its features and functions, it is made well understood that Odoo encompasses the same or more robust features helping your business requirements and their effective management. As Odoo comes API-friendly, it comes with an easy integration. The integration in Odoo comes very handily as it significantly reduces the behavioral change when a company adopts a new ERP application for managing their business workflow. In addition, Odoo comes highly modular in nature with additional module support for business, making its implementation quicker and easier via one module at a time. Also Odoo provisions numerous module variants, it can be seamlessly applied to different business industries upon their requirements. This feature of Odoo, makes its Odoo implementation, an advocating choice for SME’S rather than proprietary ERP software implementation, which is not only risky but also expensive. Odoo offers a high degree of customization upon the different business verticals. As every business process is different with respect to their features and functions, the software they implement should also be in accordance with the functional variants to draw maximum efficiency and productivity. Odoo customization gives a fully functional application that perfectly fits business workflows. Secondly, Odoo customization assures with a meeting of both long term and short term software implementation for one’s business portfolio. To further extend the functionalities of Odoo, the software comes with seamless integration of 3rd party software. Licensing costs often trigger disturbances and tensions for businessmen. License cost comes out of proportionate to business expenses in many cases. If we take the case of proprietary software, they come along with monthly/yearly licensing costs associated with their products. But on the other hand, when a business opts for Odoo implementation for their business management, there comes no license fee giving great relief to enterprises especially the smaller and medium business enterprises. Being an open source solution, the source code of the product can be easily downloaded, helping the business sector to invest their saved money for future customizations. Your Odoo implementation turns successful if you get hold of a right Odoo implementation Partner. Refer our blog: how to choose the best odoo implementation partner for understanding the basic fulfillment conditions of choosing the right Odoo implementation partner for your business.